Of course, on the off chance that folk might be interested in football outside of the Premiership, there’s always the podcast of BBC London’s Non-League Show which, despite it’s host, is fairly generous with it’s coverage. Nik – The Football Ramble covers loads more than just the Premier League. We talk about Spain, Italy, South America, Asia and Africa pretty regularly. Off the Ball on newstalk have a great show in Ireland…with podcasts. the Times podcast panelists/experts(? )normally sound like the clueless scouse halfwits on 606. Tony Evans/Alyson Rudd especially. the 5live world footy phone-in is worth a listen. @ Fletch – Gotta agree about Rudd. Insanely annoying. Don’t mind Evans, despite his Professional Scouser Schtick. Gotta love Barry G he’s the dude. 5live world footy phone-in is great, save for the occasional repetition of subjects & callers. can’t make my mind up about tony evans. he has been saying for ages now that man u are in trouble, and looks like he’s being proven right. he’s rarely on after lpool lose tho, so recently he’s been absent a lot. the ramble is ace, but clearly the guardian’s football weekly is the best out there. Not entirley suprising that your LNONDONcentric, but how can you leave out ManCity’s bluetuesday POD? The biggest hit (literally) on the BBC’s iPlayer when it comes to footy pods. 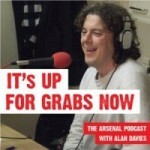 Also agree with Stu, world football phone in pisses on the game podcast. And its a DAILY podcast. I used to listen to the whiners vags at ESPN soccernet and I could take Adrianno Russo but the others were unbearable after 10mins. Graham Poll’s insights into the game are extremely illuminating, Kevin Day puts the obsession with the EPL into perspective and Roy from Championship Manager answers some very interesting Statto questions. All done in an entertaining way. Top marks.